Robert Redford and Lee Bycel at San Francisco's Sundance Kabuki Theater in February. Last December, the nonprofit Redford Center joined forces with Duke University's Nicholas School for the Environment to hold a summit on water and the West. The event brought together interested parties such as ranchers, environmentalists, and political leaders. But it began rather oddly, with executive director Lee Bycel asking the group to discuss a short story he handed out, "The Ones Who Walk Away From Omelas," by the renowned science fiction writer Ursula K. Le Guin. The story's subject — a town that bizarrely relies for its happiness on the fact that one child is kept in the basement. While this story may seem far removed from the challenges facing the Colorado River Basin, Bycel said he asked those gathered to think about basements in their own lives. He also handed out writings by the Greek philosopher Plato. Meanwhile, musician John Forté, formerly of the Fugees, also performed and participated in the two-day conference. "No papers were given," Bycel noted. Such quirky details highlight the Redford Center's offbeat approach to its areas of concern. While many nonprofits have narrow goals such as saving the bay, promoting small schools, or delivering shoes to the poor, the Redford Center's broad and amorphous mission is to inspire "positive social and environmental change through the arts, education, and civil discourse." Bycel said he likes using the arts to get people to use their imaginations and think of an event's themes more broadly. The Redford Center — as in Robert, the Utah-based actor, director, and environmentalist — quietly opened last March in Berkeley and moved into the downtown Brower Center a few months later. 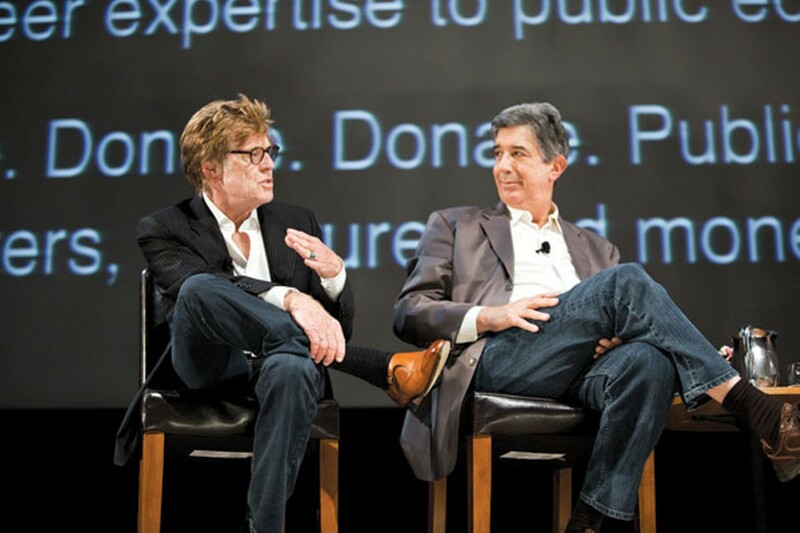 Initially funded by Redford, his family, and some friends, the center hopes to use the power of celebrity to shed a spotlight on local activists and bring together people to discuss issues such as water, arts, and public education. The center's main focus is to create retreats at which civic and corporate leaders, scientists, and others tackle public policy issues. Artists and filmmakers will take part in the discussions as part of an effort to create discourse among people who normally wouldn't meet each other. In other words, it isn't trying to solve problems per se, but rather to be a convener. Bycel met Redford in November 2008, when he interviewed for the position of the new center's executive director. An ordained rabbi whose work in recent years has focused on international humanitarian relief, Bycel, 61, says he took the job as executive director because he thought it would be a good vantage for encouraging people to become activists in their own lives. He grew up in southeast Los Angeles, coincidentally not too far from Redford's Santa Monica home. In 1966, at the age of seventeen, he moved to the Bay Area to attend the University of California at Berkeley. "I was totally ill equipped for everything that would hit me here," Bycel said. He traveled around America after graduating in 1971, and held a variety of jobs. He then decided to become a rabbi, and after five years of education, in 1979, he became the assistant rabbi of Congregation Rodef Sholom in San Rafael. His résumé includes being dean and director of the Rabbinic School at Hebrew Union College in Los Angeles and president of the Brandeis-Bardin Institute in Brandeis, California. From 1992 to 1994, he served as president of the County of Los Angeles Commission on Human Relations. But Bycel came to a turning point when he started learning about the Sudanese human rights situation in 2004. He had been disappointed with his own inaction during the Rwanda genocide in 1994. And now something similar was happening again in Darfur. "I heard about Darfur and people comparing it to the Holocaust, where lots of people stood by," he said. "I was alive during Rwanda but I didn't do anything. I had two kids, the usual constraints." So during Yom Kippur in 2004, Bycel went to refugee camps in neighboring Chad as a volunteer with the Santa Monica-based International Medical Corps. He saw the camps that house 275,000 Darfurian refugees. He became the organization's senior advisor for global strategy, and has gone back to Chad four times. After his work with the International Medical Corps, in 2007 Bycel was named the executive director of the western region of the American Jewish World Service, a nonprofit organization providing humanitarian assistance and emergency relief to people worldwide. Now, after years of personal involvement in activism, Bycel plans to help celebrate it at the Redford Center through a regular event called the "Art of Activism," where a celebrity activist is interviewed on stage and two local activists are honored. At the center's inaugural public event at San Francisco's Sundance Kabuki Theater on February 4, Bycel interviewed Redford about the genesis of his activism. Redford told how as a child who was turned off by school, he was saved by the love of the arts. The center's first two honorees were Victor Diaz, principal of the high school continuation school Berkeley Technology Academy, and Avery Hale, of Kentfield, the 15-year-old who founded Step by Step, an organization that delivers lightly worn shoes to people in developing nations. But with such a broad mandate, how will Bycel know if he and the center are succeeding? During an interview at his office on the fourth floor of the Brower Center, he answered that question by jumping up to point to a photo on the wall of a smiling African girl. How will we know if she is the one to discover the cure for cancer? he asked. "We don't," he said. "How can we know the impact changing one life will have for the world? We don't." "Running a nonprofit is harder than running a business," Bycel added. Success, he said, tends to be harder to measure for the nonprofit. "Nonprofits have become more accountable in all the way boards want, that income pays for expenses and they receive a good response. But what really matters for a nonprofit is did it impact people in a significant way and motivate them to action. That outcome is not measurable." And nonprofits can suffer from what he called "mission creep," trying to do more than they can do and thus losing purpose. Still, the center's goal is to come out of these gatherings with something concrete. For the water summit, the group is working on a joint statement of principles and has discussed making a short documentary film about water issues. Robert Redford has long had an activist bent, particularly in the area of the environment. In 1989, at the Sundance Preserve in Utah, he hosted an event called Greenhouse Glasnost to look at the issue of global warming years before most people had ever heard of it. The Redford Center is an outgrowth of programs that have taken place at the Sundance over the years. In addition to creating programs, the center is the Sundance Preserve steward, which means protecting 2,000 acres of open space in the North Fork Canyon near Provo, Utah. In 2008, the Redford family decided to make the center a separate entity and house it in the Bay Area, partly to tap into the political and cultural activity of the region, and partly to be close to Redford's son, James, who lives in Fairfax and serves as the center's chairman. While Bycel and his two co-workers will plan the Redford Center's programs in Berkeley, many of those programs will still happen at the Sundance resort in Utah. It is too early to determine the impact, if any, that the organization might have on the Bay Area. Bycel said he considered headquartering the center in the Presidio but felt that the location would make it feel "removed" from Bay Area life. In Berkeley, they are close to the university and the arts area. Although funding for the center comes primarily from Redford and his family and friends, the organization's goal is to become self-sustaining, perhaps with benefactors who want to sponsor specific programs. At the same time, the center's leaders do not want its programs to be just for the rich. "We want economic diversity at summits, so we have to have it subsidized," he said. What the Redford Center will become, of course, will be evident as time passes, as well as where it fits among nonprofits in the East Bay. The center is "going to look for collaborations that make sense," Bycel said. "The Bay Area is about taking responsibility and activism. We need activism that is strategic, tactical, and collaborative. The ultimate measure of our success will be in the many contributions we hope to make that will lead to a more just and humane world." Kevin Rowell wants you to replace your chemical paints, fiberglass insulation, and pressure-treated lumber with non-toxic materials.